Lalon Fakir was born in 1774 in an obscure village in the district of Kushtia, now in Bangladesh). One of the greatest mystic-singers the Indian subcontinent has ever produced, Lalon was perhaps the most radical voice in India during British colonial rule. Like Kabir, he had no formal education and lived in extreme poverty. Writing in nineteenth-century lyrical Bengali. Lalon composed numerous songs which still provide spiritual and political inspiration to the Bengali rural peasant--a class from which Lalon himself came, and also to freedom-fighters all over the world. He celebrates the freedom of body, soul, and even language from all repressive and divisive forces. 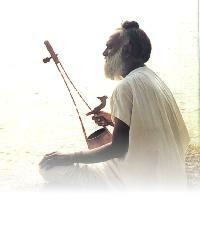 Always opposed to casteism, sectarianism, and colonialism, Lalon represents and exemplifies the true revolutionary and secular nature of his community known as "Baul", a community of lower-class, illiterate, wandering singers whose wisdom and wit do not come from academic training, but from an active contact with a life intensely lived.